Hines Ward, coming to a television broadcasting booth near you? After spending his entire career in the blue collar black and gold of the Pittsburgh Steelers, Hines Ward just wasn’t comfortable with continuing his career outside of the friendly confines of Pittsburgh’s Heinz Field. Even though he maintains that he’s still got what it takes to be an NFL receiver, he’s willing to admit that 14 years with one team is a good run and maybe it’s best not to push his luck. 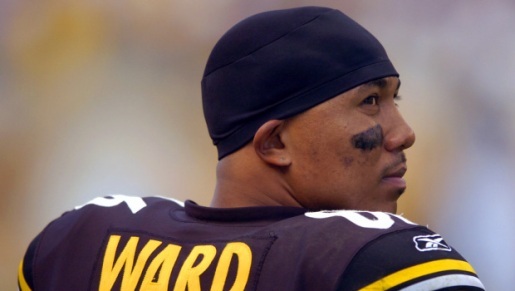 Hines Ward is retiring a Pittsburgh Steeler. Ward retires as the all-time receptions leader among Pittsburgh Steelers, with 1000 catches. He also leads the team in receiving yards and touchdowns, putting him ahead of two Hall of Fame wideouts (Lynn Swann and John Stallworth) and making him a candidate for the Hall of Fame himself. Ward is 8th all time in receptions in NFL history, and one of two wide receivers with over 1000 catches and two Super Bowl rings (I’m not sure who the other one is, but I’m going to say Jerry Rice).